Ronde Barber intercepted Drew Brees in the first quarter to record his 46th career interception. The Saints defense allowed over 500 offensive yards to the Buccaneers. Josh Freeman threw for a career high 420 yards and 3 touchdowns. Tampa Bay defense held the Saints to 81 rushing yards. Vicent Jackson had 7 receptions for a franchise record 216 yards and a touchdown. Jackson had a 95-yard catch, but failed to score after Malcolm Jenkins tackled him from behind. Connor Barth missed a field goal. Trailing by a touchdown in the final two minutes, Freeman drove the Buccaneers to the endzone. On the final play of the game, Freeman threw a game tying touchdown pass to Mike Williams in the back of the endzone as time expired. However, the touchdown did not count because he stepped out of bounds before making the catch. This was the first home game of the season that was not blacked out and televised locally, and the first Sunday afternoon game at home to not be blacked out since 2009. The 2002 Tampa Bay Buccaneers Super Bowl championship team reunited in attendance for the game. During halftime, a ceremony was held to honor the reunited 2002 Super Bowl team. More than 50 players and coaches from the 2002 Super Bowl team gathered to celebrate the 10-year anniversary of the Tampa Bay Buccaneer's first ever Super Bowl Championship. Among those who attended the reunion were former head coach Jon Gruden, former defensive coordinator Monte Kiffin, Derrick Brooks, John Lynch, Warren Sapp, Brad Johnson, Mike Alstott, and Keyshawn Johnson. Ronde Barber was part of the 2002 Super Bowl team, but was playing on the field for Tampa Bay. Josh Freeman threw for 189 yards and 2 touchdowns. Doug Martin rushed for 128 yards and scored a rushing touchdown during the fourth quarter. Martin broke Cadillac William's rookie rushing yard record during the game. Vicent Jackson had 131 receiving yards. In the third quarter, Mike Williams caught a 1-yard pass from Freeman. In the fourth quarter, Jackson caught a 13-yard pass from Freeman. The Tampa Bay defense held the eagles offense to only 29 total rushing yards. The Tampa Bay defense had 6 sacks throughout the game. Lavonte David had a sack, Daniel Teo-nesheim had a sack, Michael Bennett had two sacks, and Gerald McCoy had two as well. Ronde Barber led the team in tackles. Josh Freeman threw for 222 yards, a touchdown, and an interception. Freeman is the first ever quarterback in franchise history to throw for 4,000 yards in a season. Freeman ended the season with 27 passing touchdowns in a season which was another record in franchise history. Doug Martin rushed for 142 yards. Martin scored a 40-yard rushing touchdown in the third quarter. Mike Williams caught an 8-yard pass from Freeman in the second quarter. Connor Barth scored 3 field goals throughout the game. Barth scored from 22, 42, and 48 yards. On defense, Mason Foster led the team in tackles with 11 total tackles. Lavonte David had a sack and Daniel Te'o-Neshiem had a sack as well in the game. Dekoda Watson blocked a punt in the second quarter. The Tampa Bay defense held the Falcons offense to only 65 rushing yards. 1 2 3 4 "A Record Setting Day". 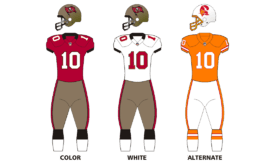 Buccaneers.com. 2012-12-30. Retrieved 2012-12-30. ↑ "Buccaneers to honor Ronde Barber's starts streak in season opener". Bucs Beat. Tampa Bay Times. 2012-06-27. Retrieved 2012-08-27.